Tradecorp recently presented Biostimulation 360º, a new concept to promote the correct approach towards different kinds of abiotic stresses. The Biostimulation 360º campaign entails a series of training activities to foster an efficient use of biostimulants and encourage proper crop handling, fully covering the plant’s biostimulation needs from sowing to harvest and from roots to fruits. Based on a 2-year calendar, the campaign will address different types of abiotic stresses, such as; crop management stress, growth stress and unfavourable climatic conditions (hot and cold temperatures, drought or salinity). It will also focus on a detailed explanation of key topics in biostimulation such as the priming effect (Primactive) and precision biostimulation, a new concept about the delivery of targeted, specific solutions. The information and recommendations provided in the campaign are the result of Tradecorp’s in-depth research in collaboration with renowned institutions, such as, Queen’s University of Belfast (UK), Polytechnic University of Madrid (Spain) and the DiSAA of University of Milano (Italy), along with the fieldwork accomplished over the last 15 years, whose results demonstrate the key role biostimulants play in the performance of the crop across its whole cycle, from the moment a seed is set in the field until it provides profitable produce. The campaign addresses farmers, agricultural experts and technicians of the distribution channel. The Biostimulation 360º campaign will deal with different types of abiotic stresses and will provide specific solutions to approach the biostimulation needs of the plant, from sowing to harvest and from roots to fruits. “Today, Biostimulation 360º is a reality thanks to the thorough and exhaustive research on biostimulation that Tradecorp has been carrying out for the last decade,” said Carlos Repiso, Biostimulants R&D coordinator in Tradecorp. “Delving into biostimulants’ mode of action, as well as their performance on different crops in the field, allows Tradecorp to define a precise application of biostimulants and the best technical advice, enabling the farmer to maximize their return on investment,” added Repiso. “The Biostimulation 360º campaign aims at bringing all this knowledge to the field, answering many of the questions that are usually raised by farmers and crop technicians regarding biostimulants,” stated José Nolasco, Strategy and Innovation Director in Tradecorp. 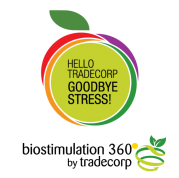 “With this new proposal, Tradecorp keeps working on its commitment to provide farmers with the proper knowledge and experience related to the abiotic stress management to reach crop’s full potential,” added Nolasco. Solutions based on seaweed extracts from Ascophyllum nodosum: Phylgreen range is comprised of specific solutions for every development stage of the plant, and for different types of abiotic stress. Its “priming effect” is capable of anticipating and preventing the stress’ negative action, as demonstrated by several scientific tests at recognized universities and research centres. Solutions based on humic acids: With over 130 trials conducted worldwide, products such as Humifirst and Humifirst WG have proven their efficacy on several types of crops by achieving an increment in water and nutrients available for the plant under stressful conditions.